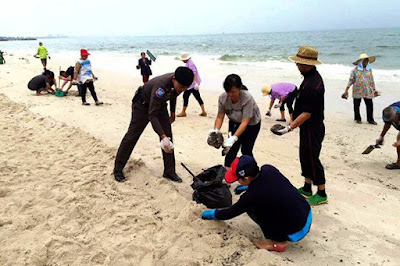 On the 27th October 2015 An oil slick about ten kilometers long hit the beach of Hua Hin producing horrid smells and driving away local and foreign tourists from the beach. The presence of the oil slick prompted Hua Hin mayor Nopporn Wutthikul to seek help from the Navy to find out if the problem was caused by oil spills from commercial freighters or large fishing boats or any of those vessels sank in the sea off Hua Hin causing the oil spills. Specimens of the oil slick were sent to the environment office for testing to confirm what had happened and how. Hua Hin officer Sutthipong Klai-udom said it was initially suspected that the oil was deliberately dumped into the sea by a vessel dealing in contraband goods. Tourists were advised not to venture into the sea for 1-2 days until the situation has returned to normal. Government workers and local residents began cleaning up Hua Hin beach on Wednesday after the Prachuap Khiri Khan coastline was fouled with oil, tar balls and petroleum-coated garbage. The clean up began at 9am. Tourists and locals should not go swimming in the sea unil notices have been put up by government officials.